Gutter systems serve an important role in managing the rainwater coming off a roof and directing it typically away from the building. Especially in urban settings where stormwater can threaten below-grade spaces. 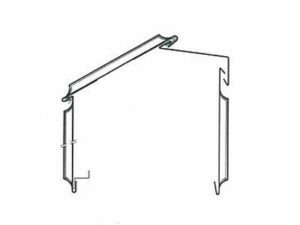 Gutter profiles installed past the roof structure can have several standard designs (half-round, quarter-round, box, k-style). While all are open, the half-round design is the strongest and most efficient shape for carrying water to the outlets. Adding more strength is the steel material that can better resist the loads the system encounters (span between support brackets, snow & ice build-up, service ladders, or other applied loads. To satisfy all aesthetic needs, color-coated steel on both sides help protect the metal and create a profile that matches from every viewing angle. 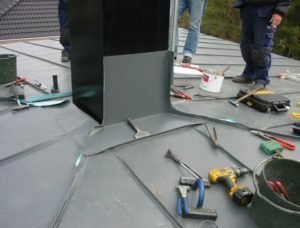 Why Color-Coated Steel Sheet-Metal Flashing and Trim? 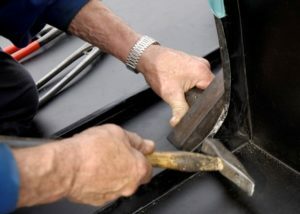 Architectural sheet-metal flashing and trim often present many different metal fabrication and installation challenges. GreenCoat™ color-coated steel offers several solutions for difficult exterior applications to help create the aesthetic you want. For many metal trim applications, GreenCoat™ colorful steel is available in Commercial Steel (CS) and Foldable Steel (PLX). Each SSAB steel grade can provide a functionally service through its strength or malleability. The GreenCoat™ color coating provides the durable aesthetic. See the individual product data sheets for recommended applications for each material. You can also find the current GreenCoat™ color selection guide on the SSAB website covering all paint-resins.